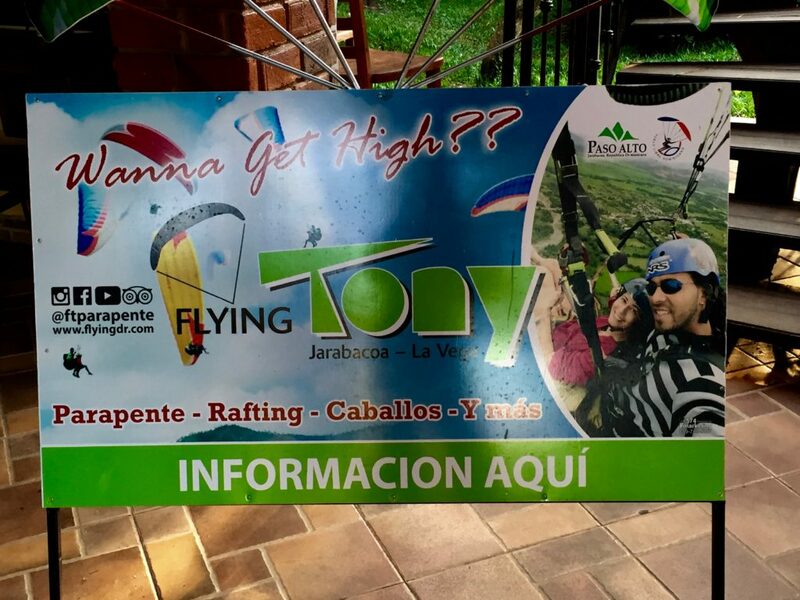 The sign for Flying Tony’s adventure tours that included white-water rafting Rio Yaque del Norte caught my eye as we registered at Hotel Gran Jimenoa. Placed near the front desk, I couldn’t take my eyes off the thing. I’d come on this trip to the Dominican Republic very tired and all I wanted to do was bask in the sun by the pool. But part of me knew that one day of lounging would be enough. Still, white-water rafting? JM Bryce: This blog is dedicated to seniors who want to travel and experience adventures despite their age. 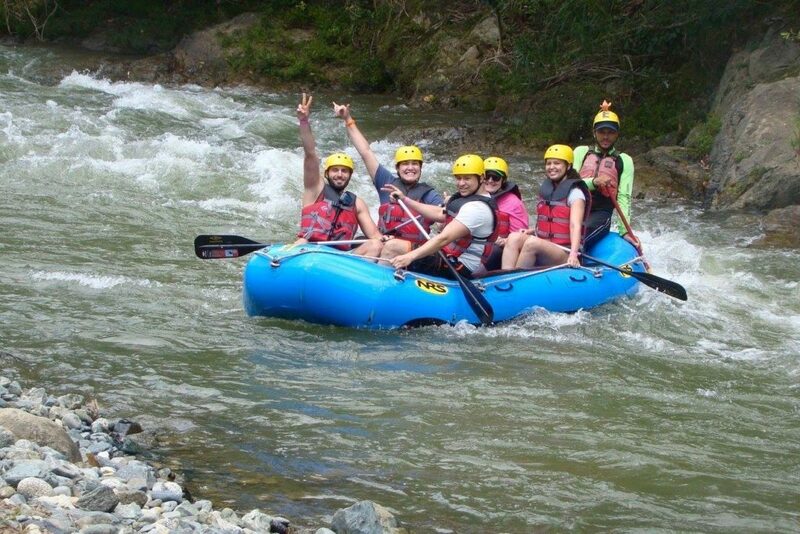 Can you focus your experience of white-water rafting in Jarabacoa with them in mind? Mary: Sure. I was vacationing with my mom who is in her mid-60s. I’m 35 and in excellent health, but I worried about her. I kept wondering how much of a risk it would be for her. We mulled it over for a while, my mom saying all along that we both needed to do it. Finally, we decided to take it one step at a time. If we signed up today, but it looked too dangerous when we got to the river the next day, she could always back out. We completely agreed on that. 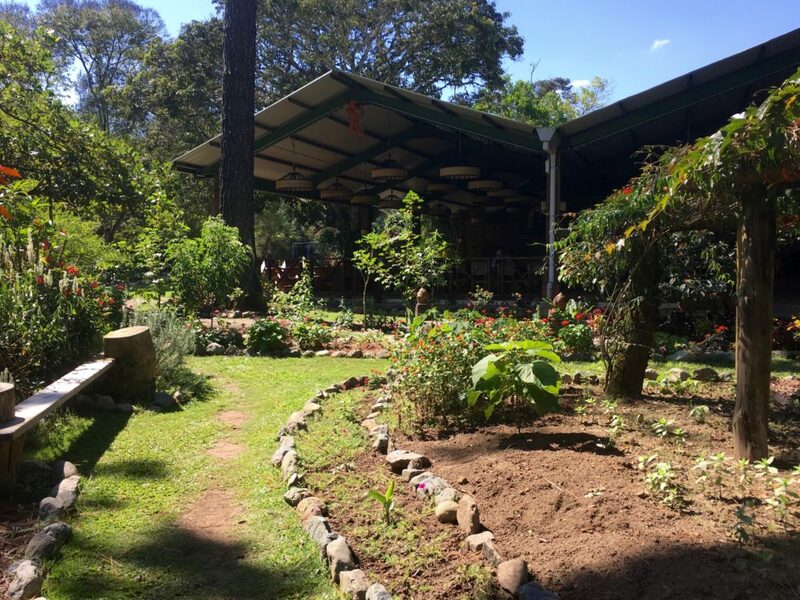 JM Bryce: I understand the tour began at Rancho Baiguate, which is known as a full-service hotel for adventure-prone tourists in Jarabacoa. Mary: The buildings and grounds are attractive, but it’s kind of a basic, no frills place. They gave us a great breakfast buffet at the start of our tour. Then we saw a brief orientation video, available in many languages, that explained the commands the guides would use and what the rafter was to do for each of them. The video also pictured rafting gear, including the required helmet and life jacket, with optional wet suits. We chose our gear and climbed into the back of a big truck outfitted with two long parallel benches down each side that could seat about 25 customers. From the base, we rode for about ten minutes to the river, Yaque del Norte, located near the centre of the country close to Jarabaco. At the river, we were given another demonstration and a review of the commands. JM Bryce: So your mother didn’t back out? Mary: Nope. She was completely energised by the prospect of a great adventure, mostly because the guides created an atmosphere of trust. She was impressed with the organised, professional manner of all the guides that would be helping us. You really do put your life in their hands. We learned that “Down!” means to slide down into the bottom of the raft. I think people whose knees don’t bend very well would have a very hard time with that command. But it’s extremely important to be able to do it. That’s because whenever the river becomes rough and dangerous, if you’re all in the bottom of the raft when you hit a rapid with a three or four-foot drop, you won’t fall out into the river. JM Bryce: Besides a senior needing flexibility in the knees, was there any other part of it your mother found difficult? Mary: Not really, but only because she has good upper-body strength. When the guides needed us to be up and paddling, you have to be able to pull yourself up on the rope that runs around the edge of the raft. Paddling requires a seated position. JM Bryce: Did you have to move up and down a lot? Mary: Yes. For every rapid, you go down, and for every calm stretch you pull yourself up. My mother could do that just fine, but if a senior hasn’t got the strength for it, then white-water rafting isn’t a very good choice. We made it through the rapids! 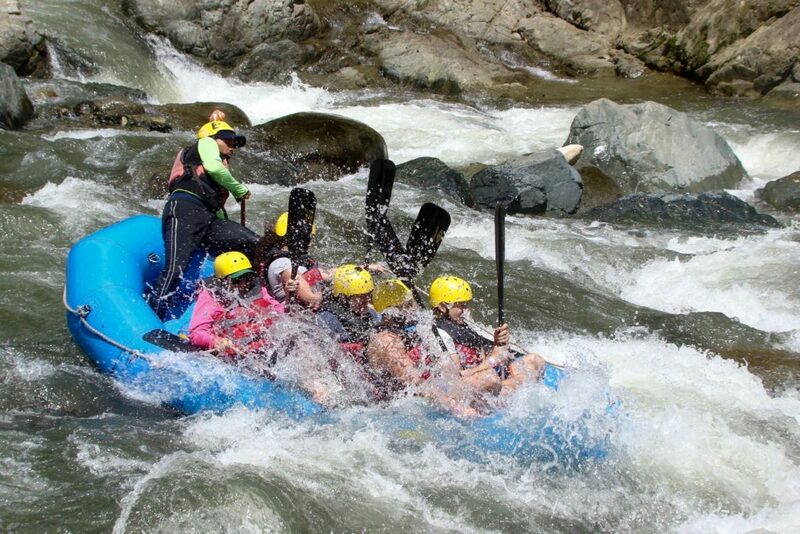 We were told where to sit in the rafts, which were designed to hold 4 or 5 riders plus one guide. My mom and I felt so lucky to be assigned to the raft having Checo as guide because he was by far the best raftsman on the river. His commands were precise and we could always hear him, plus he never once hit the rocks on the sides like I saw happen to some of the others. 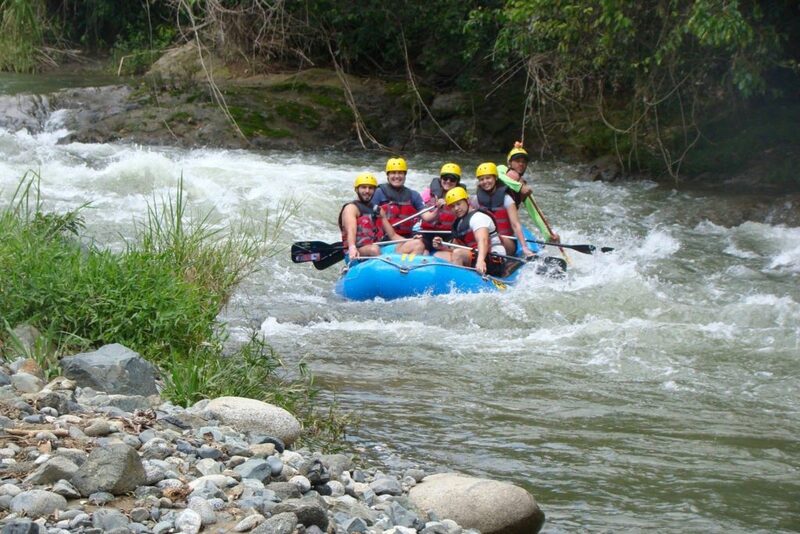 The trip started out with a punch as the rafts careened into adrenaline-pumping white water. In fact, there was more white-water than calm water along the stretch of the Rio Yaque del Norte that we traveled. We started on the water about 10:30 AM and finished a distance of 13 km in about 1 to 1½ hours. All the rafts stayed together, with each boat waiting for the other. One raft with two guides would go first. They’d climb onto the bank or a little promontory beside the river to photograph the trip for us. Not only did they take stills, but they also provided us with a video at the end. Along the way, when we’d come to a waterfall, Checo would paddle over to it and get everybody wet. The raft drained automatically, so we didn’t have to do any bailing. During calm stretches Checo would tell us stories about the river and the rocks, make jokes, and give us insights as to what he’d seen over the years. He kept the rafters laughing and having an enjoyable time. And then we’d hit some more white water and he’d get us safely through. Before every rapid, our guide Checo would tell us its name. Some were funny, like “The Mother-in-law” or “Mike Tyson,” or the whirlpool called “The Toilet.” About mid-way through the trip we came to the most dangerous rapid. The boat got almost completely submerged and at first I didn’t see how we could bob back up again. But we did. At the end, we hung up the boats and had a very nice buffet lunch at Rancho Baiguate, the little hotel where we began. After lunch they showed us the video they’d made, which we could also buy if we liked. I grew up in Hawaii, so I know that something like this river trip in Hawaii would have been terribly expensive. I was impressed that such a small number of well-managed personnel could do everything. The guides were always fun and laughing, which helped us relax and have a good time on the adventure. 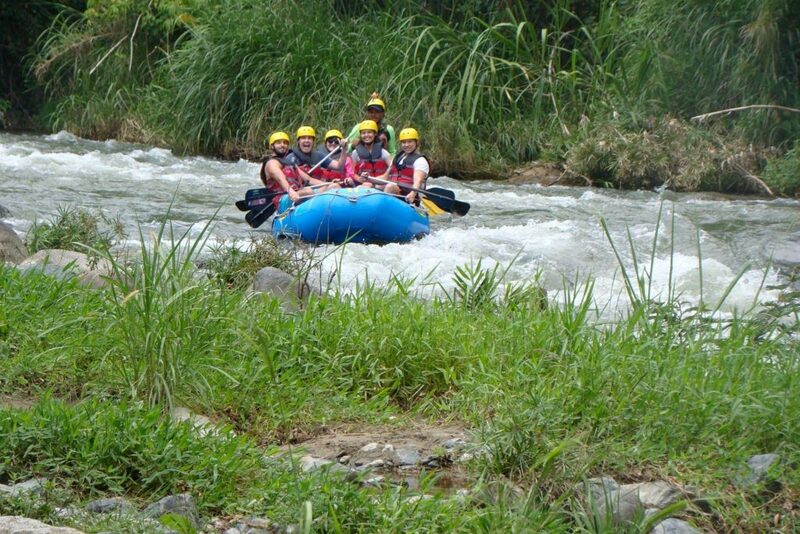 They were very organised and provided a highly sophisticated rafting experience. 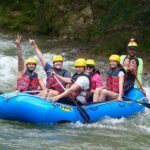 All-in-all, a senior traveler in good health should have no problem with the rafting as long as s/he is willing to take directions, can slide into the bottom of the raft on command, and then pull him/herself up again. For more blog information on the Jarabacoa area from JMBryceTravel, go to Paragliding Jarabacoa’s Mountains and Hiking Jarabacoa’s Salto Jimenoa. 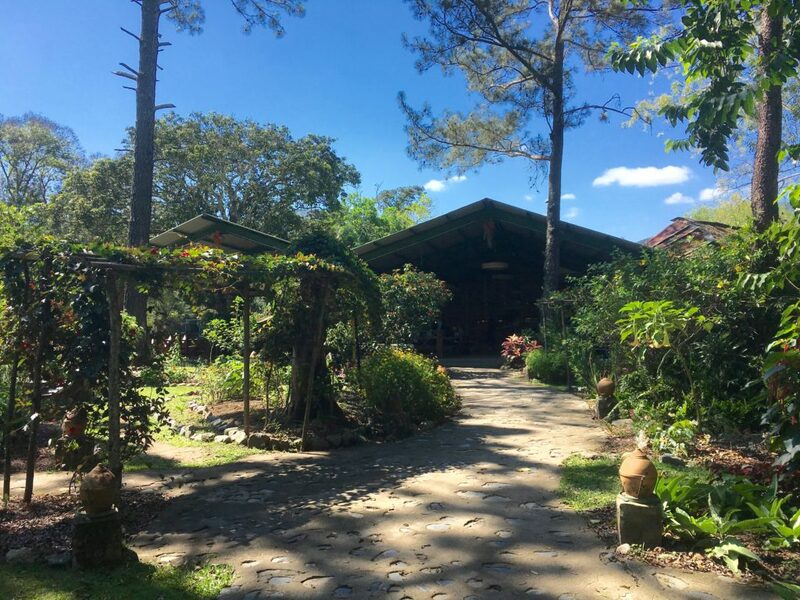 Rancho Baiguate is a full-service hotel for adventure tourists. 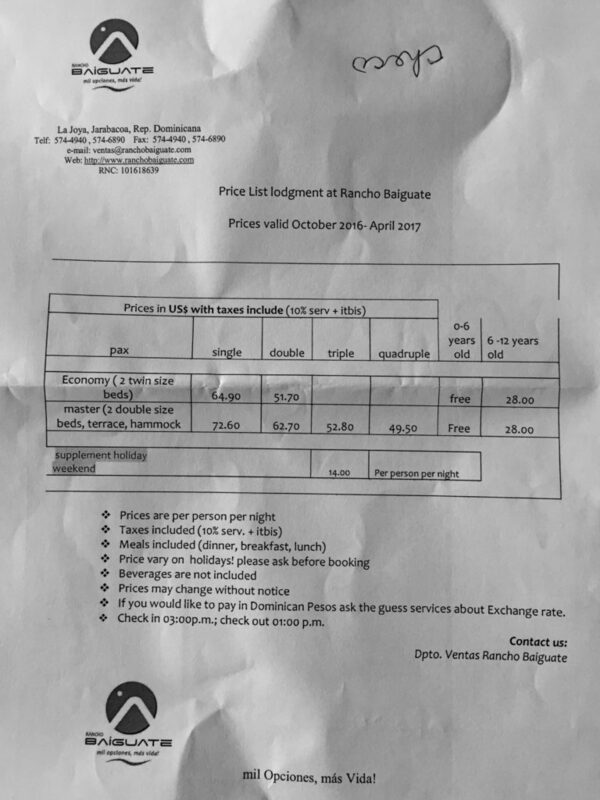 The prices for food and lodging seem very reasonable. 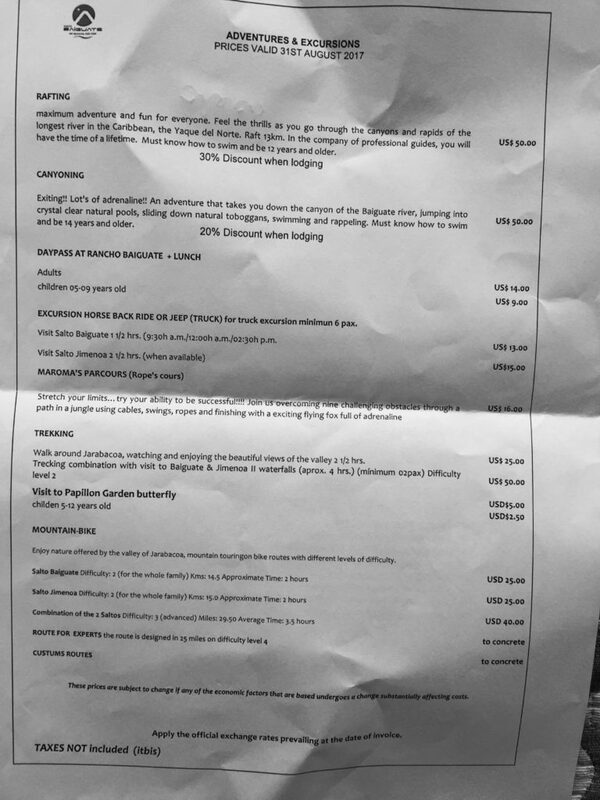 And take a look at this Adventures and Excursions list. It has about everything on it a person would want to do! Right?